This study investigates the spatial water quality pattern of seven stations located along the main Langat River. 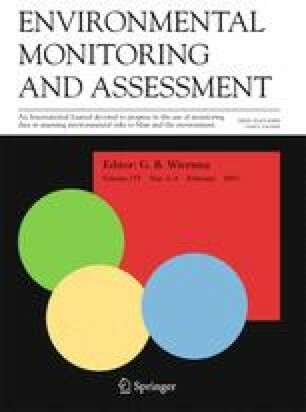 Environmetric methods, namely, the hierarchical agglomerative cluster analysis (HACA), the discriminant analysis (DA), the principal component analysis (PCA), and the factor analysis (FA), were used to study the spatial variations of the most significant water quality variables and to determine the origin of pollution sources. Twenty-three water quality parameters were initially selected and analyzed. Three spatial clusters were formed based on HACA. These clusters are designated as downstream of Langat river, middle stream of Langat river, and upstream of Langat River regions. Forward and backward stepwise DA managed to discriminate six and seven water quality variables, respectively, from the original 23 variables. PCA and FA (varimax functionality) were used to investigate the origin of each water quality variable due to land use activities based on the three clustered regions. Seven principal components (PCs) were obtained with 81% total variation for the high-pollution source (HPS) region, while six PCs with 71% and 79% total variances were obtained for the moderate-pollution source (MPS) and low-pollution source (LPS) regions, respectively. The pollution sources for the HPS and MPS are of anthropogenic sources (industrial, municipal waste, and agricultural runoff). For the LPS region, the domestic and agricultural runoffs are the main sources of pollution. From this study, we can conclude that the application of environmetric methods can reveal meaningful information on the spatial variability of a large and complex river water quality data.